It's an interesting concept and surely takes some of the hassle out of car shopping for those who are serious potential buyers. I wonder though how many tweets will be people testing how this concept works with no intent of really buying. They are tweeting pictures of test drivers like @BrianGainor (Brian Gainor) @LauraGainor (Laura Gainor) who tried out the LaCrosse last week. Laura is a social media strategist for a marketing+pr agency and blogged about her experience. 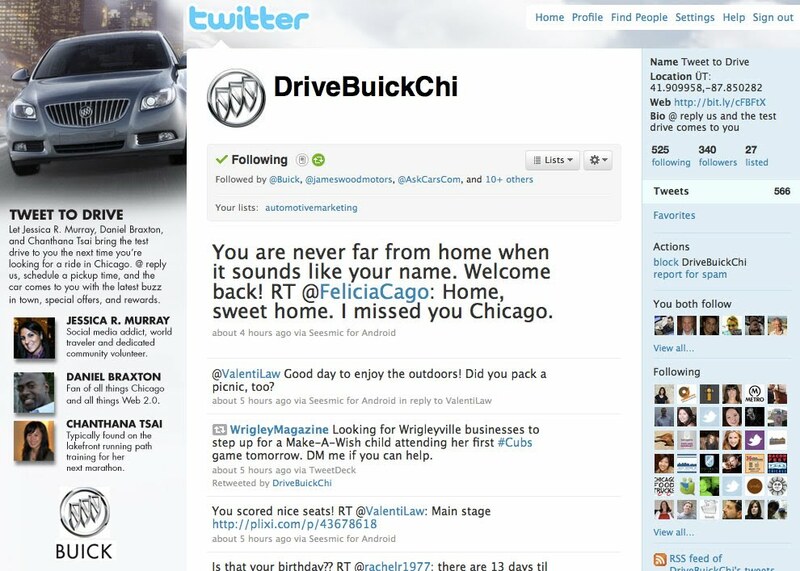 Buick is spreading the word by posting a photo gallery on its Facebook page. I'm not sure if other efforts are happening to get the idea some reach. They have also created a Facebook event from August 1 to October 31 for those who want to attend a drive. To further increase interest, test drivers can win VIP tickets to an event if they are lucky to find some tickets under the test drive car's seat. I do like the idea of Tweet to test drive. It's an interesting idea and one that could work very well for a dealership. One wonders why this concept wasn't extended to a dealer instead of going with three social media experts. I get the obvious reason, but why not train a dealer and test-pilot how effective this can be and then broaden its reach to other markets. Love this marketing idea: I always want my company to be thinking of ways to help clients stand out from the competition, and innovative programs like this really help a lot. As a follow-up, check out this article: http://bit.ly/aDZ9Pv: Mitsubishi is trying out a new concept - virtually test drive the new Outlander. What do you all think? Could this idea catch on?